MACOMB, IL -- The Western Illinois University Study Abroad Office and Department of Foreign Language and Literatures will host two interest meetings at 3:30 p.m. Thursday, Nov. 2 and at 5 p.m. Wednesday, Nov. 15 in Morgan Hall 330 for students interested in studying abroad in France. 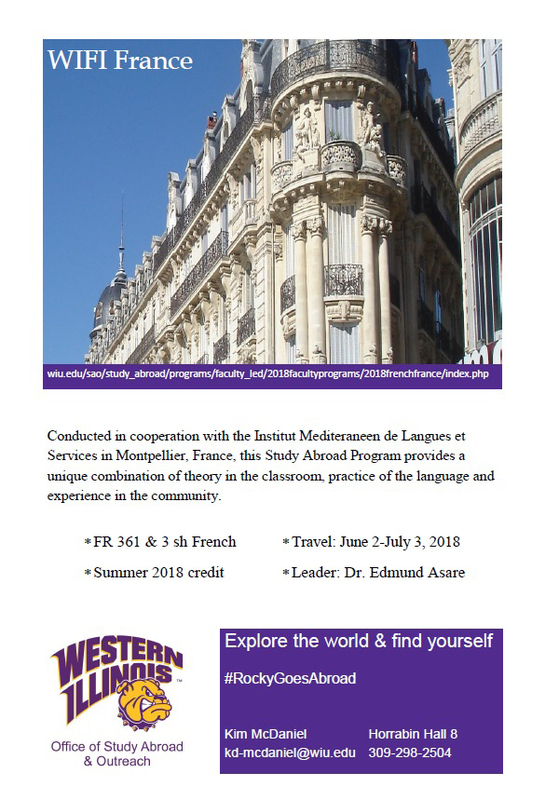 The opportunity runs from June 2-July 3, 2018, in Montpellier, France and is a four-week immersion in French language and culture. All class sessions are held on-site in France and experience is worth six semester hours. During the interest meetings, University representatives will discuss the program and how to apply. For more information, visit bit.ly/2ynp5y6, or contact Assistant Professor Edmund Asare at E-Asare@wiu.edu or Kim McDaniel of the Study Abroad Office at KD-McDaniel@wiu.edu.